The members of the Missouri Valley Search and Rescue Team provide Child ID cards for the parents to hold onto in the event that they are separated from their child. 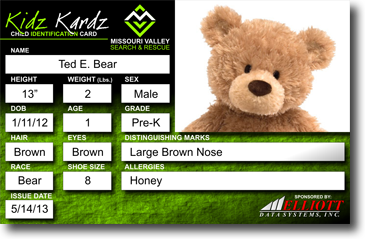 The ID cards, Kidz Kardz, are hard plastic, credit card sized identification cards that contain vital information to help those who may be searching for your loved one. These cards are great for those times you get separated in large crowds, the amusement park, large stores, etc. The cards contain information such as height and weight, hair and eye color, shoe size, distinguishing marks and more! With our very wonderful supporters help we are able to offer 1 FREE Kidz Kardz Child ID for each child. If you would like an additional copy for another parent or caregiver we ask for a minimum of a $3.00 donation for each additional card. This donation allows for us to continue this program and helps support our Search and Rescue Team's services. If you would like for us to come to your event and provide our Kidz Kardz Child ID's please use our contact form.